We’re finally at the top 3 teams of all time. We’ve seen offensive juggernauts, defensive savants,and physical brutes. Today, we’re going to look at a team that can be classified as all three. This team dropped the gloves 68 times (10th in the NHL), was 2nd in the NHL in goals for, and 2nd in the NHL in goals against. This was not a team you wanted to mess with. Oh and they had a player with probably the greatest mustache in all of pro sports. That’s gotta count for something right? 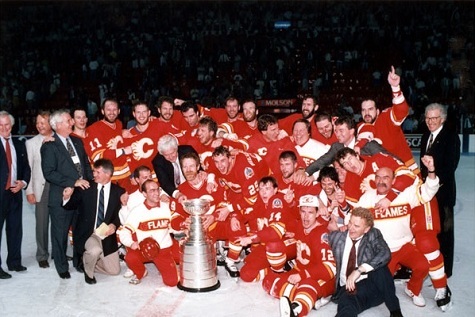 These are the 1988-1989 Calgary Flames. The 1987-1988 season was a tough season for the Calgary Flames. The Flames were awesome in the regular season, winning the President’s Trophy with a 48-23-9 record. After crushing the Kings 4-1 in the first round, the Flames got blitzed by the Oilers in 2nd round, getting swept from the playoffs. The major problem in that series was the Flames defense as they gave up 18 goals in the 4 games. They knew that they had to get better defensively if they were going to beat the Oilers next year. The summer saw the Flames make a major trade as they dealt Mike Bullard (who scored 103 points the previous season) to the St. Louis Blues for a package of players that included Doug Gilmour. The Flames also brought up Theo Fleury for his NHL debut and Sergei Pryakhin, the first USSR player allowed to play in the NHL, and the team was finally assembled. Up front, the Flames had a wealth of offensive talent, led by Joe Mullen, Hakan Loob, Joe Nieuwendyk, and Doug Gilmour. Defensively, the Flames had even more talent, led by Al MacInnis, Gary Suter, and Brad “Beast” McCrimmon. In goal, the Flames had Mike Vernon. Physically, this team was led by Gary Roberts, Joel Otto, Jim Peplinski, and Tim Hunter. This truly was one of the most complete teams ever assembled and they were chomping at the bit to get the season started. With coach Terry Crisp implementing a stricter defensive system, the Flames were determined to correct their problems from the previous season and win the Stanley Cup. Boy were the Flames ready to roll. After finishing the month of October at 6-3-3, the Flames caught fire – pun totally intended. From October 31st to December 8th, the Flames lost just 1 game. During that stretch, they went 16-1-1, including a 13 game unbeaten streak. At the end of their streak, the Flames were 21-4-4, led their division by 9 points, and led the NHL by 5 points. However, the Flames struggled after that streak ended, going just 4-4-1 to end the month and seeing their 17 game home unbeaten streak to start the season end.. Sensing that the team needed a shakeup, the Flames brought up rookie Theo Fleury, who at the time had been dominating the IHL with 74 points in 40 games. Fleury paid immediate dividends as he recorded 5 points in the first 3 games he played for the Flames. Just like that, the Flames were back on track. From the start of January until the All Star game on February 7th, the Flames went 13-3-2. For the All Star game, the Flames had 4 players selected, goalie Mike Vernon, defenseman Gary Suter, and forward Joe Nieuwendyk and Joe Mullen. Sometimes the All Star game can slow down the momentum of a team, but not in the case of the Flames. The Flames posted the best record in the NHL after the All Star break, going 17-6-1 to finish the season. That stretch saw co-captain Lanny McDonald score his 500th goal and his 1000th point. While no longer at the elite level he used to be at, McDonald was still a fantastic leader and his leadership would be extremely valuable later in the playoffs. The Flames finished the regular season 54-17-9 for 117 points, tops in the NHL. The Flames won their division by 26 points, their conference by 26 points, and the President’s Trophy by 2 points over the Montreal Canadiens. Joe Mullen led the team in scoring, scoring 51 goals and 110 points, and breaking the NHL record for points by an American player. Nieuwendyk also scored 51 goals for the Flames to lead the second wave of scoring which included Nieuwendyk’s 82 points, Gilmour’s 85 points, and Hakan Loob’s 85 points. Mike Vernon also finished 3rd in the NHL in SV% that year and further established himself as one of the best goalies of the era. Joe Mullen also won the Lady Byng award that year to bring some hardware back to Calgary. The Flames as a team finished 2nd in the NHL in goals for (4.43), 2nd in goals against (2.83), 2nd in PP% (24.9%), 1st in PK% (82.9%), 1st in even strength for/against (1.74), and had an insane home record of 32-4-4, the best home record of any Stanley Cup Champion of the last 30 years. Yea, this team was that good. In the playoffs, the Flames met the heavy underdogs, the Vancouver Canucks. However, nobody told the Canucks that they were supposed to be the underdogs in this series. The Canucks stunned the Flames in Game 1, winning 4-3 in OT on Paul Reinhart’s goal. The Flames quickly rebounded from their opening Game 1 loss, taking Game 2 by a 5-2 decision and Game 3 in a 4-0 shutout. However, the Canucks were not ready to quit and they took Game 4 5-3. In the pivotal Game 5, the Flames put the Canucks on the brink, shutting out the Canucks 4-0 again. The no-quit Canucks staved off elimination in Game 6, thumping the Flames 6-3 to set up a winner takes all Game 7. It was such a sudden turn of events for the Flames. After dominating the regular season, and cruising in the 2nd half of the season, the Flames were suddenly facing elimination on home ice. But as great teams do, they summoned up their best effort. Game 7 headed to overtime tied 3-3. The President’s Trophy winning Flames were 1 goal away from being eliminated. Midway through the OT period, the Canucks Stan Smyl got a breakaway and skated in alone on Vernon. Vernon absolutely robbed him with a flash of leather to preserve the Flames season and that save would later be known as the save that won the Cup. With just under a minute remaining, Jim Peplinski fired a shot that ricocheted off of Joel Otto’s skate and into the net to send the Flames on to the 2nd round. In the 2nd round, the Flames faced off against Wayne Gretzky and the Los Angeles Kings. In Gretzky’s first season with the Kings, he tallied 54 goals and 168 points to lead the Kings into the 2nd round. Fresh off of their scare against the Canucks, the Flames were determined to bury the Kings. The Kings were the highest scoring team in the league, but the Flames gave them absolutely no room to operate. After winning Game 1 in OT, the Flames found the extra gear, and in the next three games, they outscored the Kings 18-8. For the Kings, after averaging 4.7 goals a game during the regular season, they were held to just 11 goals in the 4 games, showing just how strong the Flames could be defensively. In the Conference Finals were the Chicago Blackhawks, led by Steve Larmer and Denis Savard. However, the Flames were in demolition mode and the Blackhawks were barely able to put up a fight. For the 5 game series, the Flames outscored the Blackhawks 15-8 and limited their offense to scarce chances. The Blackhawks really stood no chance against the Flames once they found their game and thus they fell by the wayside with relative ease. Awaiting the Flames in the Stanley Cup Finals were the Montreal Canadiens, the 2nd best team in the regular season. The Stanley Cup Finals gave all hockey fans the matchup they wanted to see. #1 vs. #2. Would it be as riveting as everyone was hoping? Game 1 saw the Flames come out strong and thanks to Al MacInnis’ 2 goal game, they were able to prevail 3-2. As expected though, this series turned into a dogfight when the Canadiens stormed back to take game 2 4-2 on the Flames home ice. Heading to Montreal, the Flames knew that Game 3 was pivotal to their chances of winning the Cup. Game 3 was a tightly contested battle that went into OT with the scored tied at 3. The game dragged on into a 2nd OT when a controversial play happened that nearly turned the series. The Flames Mark Hunter was called for boarding, giving the Canadiens a powerplay in double OT. The Canadiens did not mess up their chance, scoring the game winning goal to take a 2-1 series lead. Many in the media felt that the boarding call was very questionable and it had the ability to turn around the entire series. However, the Flames were such a veteran team that they were not going to let a call like that derail their Stanley Cup dreams. The Flames played Game 4 with a win-or-go-home mentality and the scoreboard showed it as they held off the Canadiens for a 4-2 win. Back in the comfy confines of Calgary, the Flames went back to work, storming to a 3-1 1st period lead on their way to a 3-2 victory and a 3-2 series lead. Game 6 gave the Flames the opportunity to clinch the Stanley Cup. Captain Lanny McDonald had sat out the last three games of the series, but coach Terry Crisp inserted him into the lineup for Game 6, hoping to inspire his players to “Win it for Lanny”. That move paid huge dividends as McDonald broke a 1-1 tie late in the 2nd period to put the Flames up 2-1 heading into the deciding period. Doug Gilmour tallied two twice in the 3rd and the Flames cruised to a 4-2 win and a Stanley Cup Championship. Al MacInnis won the Conn Smythe, finishing the playoff run with 31 points. The Flames were finally Stanley Cup Champions. That’s the story of the Calgary Flames. But what separated this team from other champions? The major thing was the diversity of this team. They were so good across the board, played physical, and were strong in goal. There really was no weak point to this team. You couldn’t outscore them because they had 2 50 goal scorers, 8 20 goal scorers, and 14 10 goal scorers. You couldn’t beat them in a defensive game because they were led by Al MacInnis, Gary Suter, and Mike Vernon in goal. On special teams, the Flames were simply just better. There was no weak link in this team and thus that’s why they are the #3 team in our countdown.